You need an initial consultation or second opinion highly specialized? Do you want a physiotherapy consultation fast you can solve your own home? You do not have time to go to the doctor? You do not want to wait your turn in a waiting room? Do you live a long way from a specialist center? You do not have time to travel? Talk to your doctor, anytime and from anywhere. The online consultation, as the face, allows real attention, personalized, exclusive and confidential time. What is Physiotherapy consultation via skype? 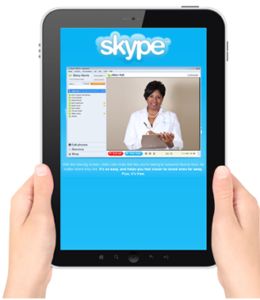 You need, if you no longer have nothing else to download the free Skype application to your cell phone, notebook or PC. It must be properly installed and tested, with corresponding webcam, microphone and headphones. Internet also good quality connection (this implies that there is at least a good audio). We are not responsible for the poor conditions of operation of the Internet at the time of the query. Rs. 750 for 20 Minutes Session.